Live Music Review/ Oakland Mardi Gras Celebration, Feb. 17, New Parish. The tradition of Mardi Gras, or Fat Tuesday, is one of New Orleans’ most enduring. But it’s also taken up residence in the Bay Area, as evidenced by Mardi Gras parades and celebration concerts on both sides of the Bay Bridge last week. Both parades were curated by the Parish Entertainment Group, owners of the New Parish and Leo’s in Oakland, and Brick and Mortar and Place Pigalle in San Francisco. The Oakland parade featured a Grand Marshal, several brass bands, and dozens of costumed revelers with the signature colored beads which are a symbol of Mardi Gras. Oakland isn’t a city which misses many chances for dancing in the streets, and who doesn’t love a good second line? While local Mardi Gras festivities can’t rival New Orleans’, they still offer an opportunity to bring out one’s inner spirit of joyous revelry, as well as make the OAK-NOLA bond even tighter. The parade began in front of Awaken Café at 15th and Broadway, and slowly marched its way down to San Pablo, in front of the New Parish, where it became a full-fledged street party. The celebration continued on into the night, as the party moved indoors to the New Parish. There, two brass bands continued to horn in on the groove, setting the stage for headliner Katdelic, a funk-rock outfit in the P-Funk mold. After all that brass, the change of musical style sounded refreshing, and frontman Ronkat was on a mission to funk up the venue (which proved successful). Ronkat showed his groovalliegance to the funk with a killer set, including a rendition of Parliament’s “Funkentelechy,” then brought MJ’s Brass Boppers to the stage for the final few numbers. The show ended with the Brass Boppers descending to the dancefloor level, which in turn encouraged the booty-shakers to work it out even more seismically. 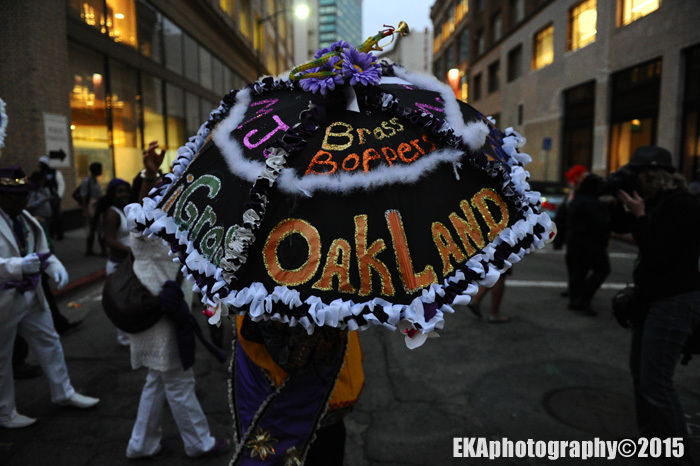 Categories: Event review, Live review | Tags: EKAphotography, Katdelic, Mardi gras 2015, MJ's Brass Boppers, New Orleans, Oakland | Permalink.